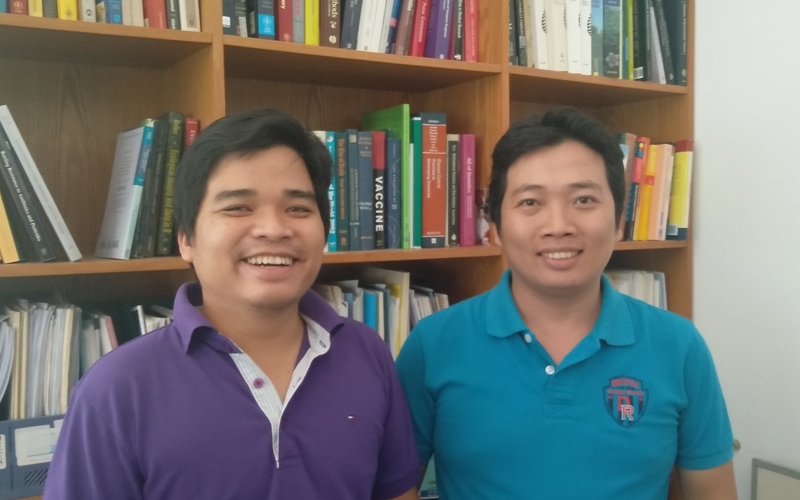 Congratulations to Dao Nguyen Vinh (left) and Tran Dang Nguyen (right) who both passed their PhD vivas this month. Vinh and Nguyen were the first two students in OUCRU’s mathematical modeling group, and they helped build the group up to its current state today, with seven people working on influenza and four on malaria. Vinh’s thesis was titled Influenza in southern Vietnam: serial sero-epidemiology investigation. And Nguyen’s was The effects of different deployment strategies of artemisinin combination therapies on slowing down the spread of antimalarial drug resistance: investigation with individual-based simulations.